For your next anniversary gift, why not give your wife or husband something simple and sweet with candy. It might not be as impressive as, say, a new car, big screen TV, or a furniture set, but a candy anniversary gift is still a good way to show your spouse how much you care by giving them a tasty treat that let them know that you wanted to get them something very nice even if it wasn't so spectacular. 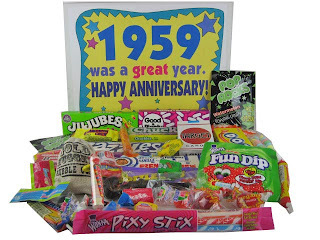 To make sure they get the message, give them an anniversary gift basket full of retro candy and nostalgic toys. An anniversary gift basket of particular note is the Gift by Year box, featuring retro candies. These gift give off a unique and personal touch that takes your spouse back to the days of their youth by giving them certain types of candy that aren't "mainstream" nor so easy to find, but are still made with nostalgia in mind for those who loved them. These gift boxes are themed by year and cover from the 1950s to the 1970s. There upwards to forty kinds of nostalgic candy per box and the variety depends on the year the box represents. Take your husband or wife back in time with the candies they grew up with, but are no longer so easy to find. Pop Rocks, Bit-O-Honey, Zotz, Candy Cigarettes, Atomic Fireballs, Boston Baked Beans, Razzles, Good & Plenty, Saf-T-Pop, Fun Dip, Wax Lips, Chuckles, Double Bubble Gum, Bonomos Turkish Taffy Taffy and Smarties are but a few of the "old school" candy brands you likely won't find in a supermarket or convenience store along with more popular and well known candy. However, many still have a special place in their heart of for these tasty treats of the past. Giving them as a gift can often prompt special memories and can bring back wonderful childhood past times. There may be more popular and maybe even better candy anniversary gifts out there. But with retro candy gift boxes, you are giving your spouse or loved one something personal and dear to their heart. They will fondly recall the past and all of the memories that accompanied them throughout their life. Show them that you were really thinking of them when looking for an anniversary gift that would be extra special to them. So for a humble but loving anniversary gift, you can't go wrong with a candy gift basket or gift box. It would mean a lot to tell your wife or husband you love them; getting a retro candy "gift by year" box to stir memories of their youth and let them taste treats they most likely haven't had a long time would mean a lot more! Don't just give them an anniversary gift basket. Give them something that says "I was really thinking of you," which is just another way of saying "I love you."